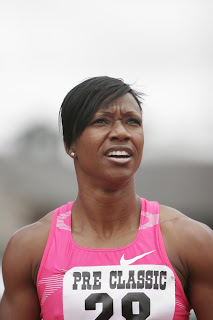 With no major championships on the schedule for next year’s 2010 season, American sprint star Carmelita Jeter is reportedly targeting a productive indoor season with winning at the IAAF World Indoor Championships in Doha also on the cards. The American failed to split the Jamaicans Shelly Ann Fraser and Kerron Stewart in Berlin, but came back from that defeat to run undefeated on her way to posting a career best and the second fastest time-ever of 10.64seconds over the 100m. Prior to that performance she out-classed her rivals with a 10.67secs run to win the dash at the World Athletics Final in Thessaloniki. If Jeter enters the indoor season with that same streak, then she will definitely start favourite to better her 7.11secs personal best 60m time clocked in 2008, as well as posting a strong challenge on Russian Irina Privalova’s long-standing 6.92secs world record. Another high-profiled athlete showing interest at racing in next year’s indoor season is Jamaica’s Veronica Campbell-Brown. The Jamaican who recently split with long-time coach Lance Brauman to work with Atlanta based-coach Anthony Carpenter, said she could compete indoors, but will wait and see the developments over the coming months.